Today was the first day of rehearsal for our winter production, Rossini’s La Cenerentola. This brilliant comic opera brings to Seattle a team of artists from around the world, including several singers who are familiar to our audience and several new voices and faces. Making their U.S. debuts with this production are our exciting young conductor, Giacomo Sagripanti, who hails from Rossini’s hometown of Pesaro on Italy’s Adriatic coast, and marvelous mezzo-soprano Daniela Pini, also Italian. Tenor René Barbera, a Texan who lives in Chicago, shares the role of Cinderella’s prince with Edgardo Rocha, a native of Uruguay who lives in Italy. Also making her Seattle Opera debut is mezzo-soprano Karin Mushegain, who sings Cinderella to Rocha’s prince. This Cinderella-story of course features two wicked sisters, sung in Seattle Opera’s production by Sarah Larsen and Dana Pundt, members of our Young Artists Program. But unlike many Cinderella stories, this one features several great male characters. 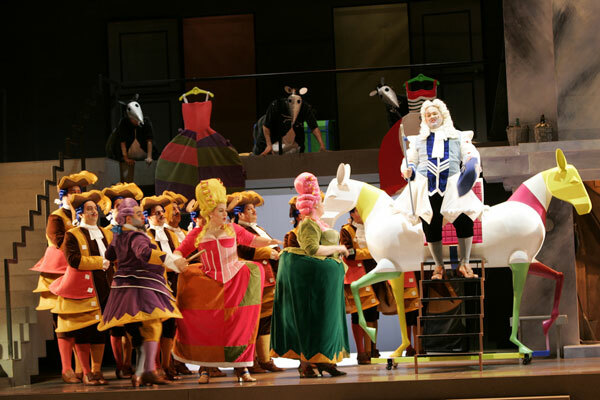 Instead of a wicked stepmother, Rossini’s Cenerentola has to deal with a wicked stepfather, Don Magnifico. Ms. Pini struggles with Patrick Carfizzi, who gave us such a fine Ping in Turandot this summer, while Valerian Ruminski, who first sang with us in '06 as Don Alfonso in Così fan tutte, makes life hell for Karin Mushegain. The great Brett Polegato, who sang such a nuanced Sharpless in Madama Butterfly last May, returns as Dandini, the Prince’s mischievous sidekick. And Arthur Woodley, fresh off his recent success as Rocco in October’s Fidelio, is back for a role that couldn’t be more different: Alidoro, the benevolent tutor to the prince who functions in this story the way Cinderella’s fairy godmother does in that OTHER Cinderella story. Actually, there are hundreds of variants of the Cinderella story, ranging from cultures such as Ancient Egypt to medieval China. We’ll explore some of them on this blog as we approach Rossini’s unique Enlightenment-era Cinderella. We'll also speak with each of our singers in these coming weeks as our production takes shape under the leadership of Maestro Sagripanti and our brilliant artistic team: director Joan Font, designer Joan Guillén, and choreographer Xevi Dorca. These three gentlemen from Barcelona first created this production several years ago for opera companies in Houston, Barcelona, Cardiff, and Geneva, and opera fans in Toronto and Brussels have also enjoyed its colorful, sweet story-telling and delightful sense of humor. Seattle (and after us, Los Angeles) is excited to be next in line for the production!